Book WestJet through rocky-peak Holidays by September 6th 2006 and save at least 30% off on travel within Canada and to the U.S. until December 15, 2006. Conditions apply. Click here now to book! On Thursday, August 10, 2006, Transport Canada announced increased security at all Canadian airports following a major counter-terrorism operation in the United Kingdom. As a result of this situation, Transport Canada has implemented restrictions for carry-on baggage. Until further notice, no liquids, gels or creams will be allowed on board any aircraft, either on your person or in carry-on baggage. Liquids or gels in containers of any size include: all beverages, shampoo, suntan lotion, creams, toothpaste, hair gel, and other items of similar consistency. These items can be placed in checked baggage but will be at the guest’s own risk. Any of the above mentioned items will be confiscated at pre-board security screening. Guests may bring aboard baby formula, breast milk, if a baby or small child is travelling. Prescription medicine with a name that matches the guest’s ticket, insulin and essential other non-prescription medicines are allowed. At time of check-in, WestJet customer service agents will give guests the option to remove any restricted items from their carry-on baggage and place them in their checked baggage. These restrictions currently apply to all flights including transborder into the U.S., domestic and international. Due to possible delays at security screening, guests are advised to check in a minimum of two hours prior to departure. All these restrictions are subject to change. For updated information on these or other Government of Canada security requirements please visit; www.tc.gc.ca or www.catsa-acsta.gc.ca or phone 1-888-294-2202. If you have any questions regarding your travel arrangements with WestJet, please contact them at 1-800-538-5696. What is the Mountain Pine Beetle? There has been a lot of concern about the spread of the mountain pine beetle. We have put together some beetle facts on this little critter, sourced mostly from the Government of British Columbia’s website. • The life span of an individual mountain pine beetle is about one year. • Each mountain pine beetle is the size of a grain of rice. • Pine beetle larvae spend the winter under bark. They continue to feed in the spring and transform into pupae in June and July. • Adult mountain pine beetles emerge from an infested tree over the course of the summer and into early fall. • The mountain pine beetle transmits a fungus that stains a tree’s sapwood blue. • Comprehensive testing has confirmed that the blue stain caused by the beetle has no effect on wood’s strength properties. • These insects have already devoured an area of B.C.’s forest the size of Iceland. • The mountain pine beetle infestation will have economic implications in the future for 30 communities around the province. • 25,000 families in British Columbia are having their livelihoods impacted by the beetle infestation. • The mountain pine beetle prefers mature timber. After 80 years, lodgepole pine trees are generally classed as being mature. • Cold weather kills mountain pine beetle larvae. Sustained temperatures of -25 Celsius in the early fall or late spring, and -40 Celsius in the winter are needed to control populations. • Hot and dry summers leave pine drought-stressed and more susceptible to attack by the mountain pine beetle. • The start of the current mountain pine beetle infestation in B.C.’s central Interior can be traced back to 1993. • The beetle has been spreading east across the Rocky Mountains since 2002, mostly in Willmore Wilderness Park and areas around Canmore. • A hectare is considered infested if it contains more than 10 beetle-attacked trees. • Mountain pine beetle outbreaks develop regardless of property lines. They can appear in mountain subdivisions, backyards and municipal parks the same as in wilderness areas. • The mountain pine beetle in B.C. is as far-ranging as Fort St. James to the north; Cranbrook to the east; Houston to the west; and Manning Park, located between Hope and Princeton, to the south. • The direction and spread rate of a beetle infestation is impossible to predict exactly. • In addition to B.C. and Alberta, the mountain pine beetle can be found in 12 western American states, and even Mexico. • If the beetles make the jump to the jack pine, an infestation could wipe out billions of trees in the boreal forest all the way to the East Coast. • The mountain pine beetle has been spotted in Grande Prairie, further north in Alberta than experts had expected. Grande Prairie is 455 kilometres northwest of Edmonton. • Alberta’s beetle hotline number is 1-877-927-BUGS (2847) for the Edmonton area. Signs of a pine beetle problem include a brown crystallized substance on the trunk of the tree, as well as sawdust around the base. Just two short months after its initial launch, backcountry enthusiasts have bombarded trailex.org with more than 10,000 hits. The site was funded and created by McCroy and friends Jean McAllister, Maria Hawkins, Liz Baker, Jennifer Statham and Tom Wolfe. McCroy’s wife, Isabelle Dubé, was mauled by a grizzly bear and killed while cross-country running in June, 2005 and Trailex was created in response to the tragedy. Users are able to post their own sightings on the site, after registering with Trailex, and anyone may view other postings related to bears, cougars, wildlife in general and trail and area closures. Had similar information been available when Dubé went running with friends Hawkins and McAllister in 2005, McCroy has vowed, tragedy, in all likelihood, would have been avoided. A simple check of bear sightings would have caused his wife to choose another area in which to run. “We’ve had no problems with bogus input or sightings,” he said. “Nobody, to my knowledge has been abusing the site at all. I think the site’s been good to help the community become more aware. Later this month, Discovery Channel is producing a documentary on bear/human conflict and Canmore, along with an Alaskan town, are to be featured. The U.S. broadcaster will interview McCroy and others about their experiences with bears; the program will air at an unspecified future date. A significant portion of Banff National Park’s old growth forest will be set afire this fall in an effort to restore crucial habitat for the area’s grizzly bears. 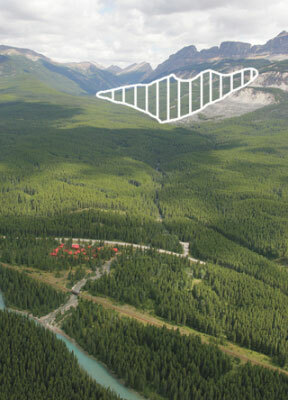 An 800-hectare area around Baker Creek will be set ablaze sometime between Labour Day and Halloween as a means of rehabilitating the natural landscaping and attracting hungry bears that have been roaming near the Lake Louise townsite. “The primary objective in Banff for some time has been to improve the grizzly bear habitat in the upper Baker Creek area,” said Rick Kubian, fire vegetation specialist for Lake Louise, Yoho and Kootenay. The prescribed burn is the first to be undertaken in the area, which has not seen a natural fire since the late 1800s. As such, most of the area – the size of 320 football fields – is made up of mature pine forest. The south-eastern portion of the area, in which the forest is thinner and leads into a rock slope, will be used as a guard to ensure the fire does not burn out of control. Fire Specialist Jean Morin, who is organizing the burn, said he is confident the “boulder areas” will ensure the prescribed burn remains safe, and describes the project as a long-term vision for the area. “We want to make sure we’re strategic when we do these things, to help us for ecological integrity, but also to keep the facilities safe,” he said, adding the creek itself will prevent the fire from spreading in the other direction. Forest fires naturally rejuvenate habitat for animals by allowing old forested areas to see a resurgence in plant and tree growth. Officials estimate the Baker Creek area – one of several sites for prescribed burns in the national parks this year – will become lush habitat for grizzlies in 15 years. “This will be a pretty popular spot for wildlife after the burn,” said Kubian. Kubian added officials will wait until wind and weather conditions are right before beginning the burn. Ideal conditions would include several days of dry weather in advance of the burn, as well as consistent wind blowing to the east in order to minimize the impact on surrounding areas. However, Baker Creek Chalets, which are only two kilometres from the edge of the burn area, will likely be affected by the project. According to Parks Canada literature, smoke from a prescribed burn would not have an adverse impact on human health, nor would it contribute to global warming. In addition to restoring grizzly bear habitat, the project aims to reduce the number of trees susceptible to mountain pine beetle and contribute to re-establishing the historic fire cycle in Banff National Park. A large area of forest (shaded) east of Baker Creek near Lake Louise is set to be burned to create a fuel reduction area in an attempt to suppress future wild fires. The Bow River, Baker Creek Chalets, and Bow Valley Parkway can be seen in the foreground. Cub dies after encounters with dogs force bears to be relocated. Mother black bear and family gone from Canmore Nordic Centre. After several incidents where a sow black bear with two cubs born this year ran at illegally off-leash dogs at the Canmore Nordic Centre over the past three weeks, conservation officers decided on Thursday to relocate the sow and its cubs to avoid any further conflicts. Unfortunately, one of the cubs did not survive. A bear culvert trap was set in a closed area at the Nordic Centre Thursday. The 23-year-old sow known to Canmore residents as Timberline had been caught in a trap three times over the past 10 years and always returned to the area, so officers didn’t believe it would walk into a trap a fourth time. They darted the bear and its cubs with tranquilizers. Although the death of the cub is very unfortunate, the surviving cub now has a better chance at making it through the winter, he said. “One surviving cub will have a better chance than two,” Naylor said. The sow and her surviving cub were taken to the Plateau Mountain area, at the very south end of Kananaskis Country, said wildlife biologist Jon Jorgenson. The sow had been living in the Canmore area for 10 years and in the Banff area prior to that, Naylor said. Before this summer, Timberline never showed any aggression towards people or dogs, Jorgenson said. “This issue has been created because of people with their dogs off leash, even in areas where it is prohibited. We now have a serious public safety issue that basically has been created by people allowing their dogs off leash,” Jorgenson said. Something may have happened that was not reported, he added. Timberline is collared with a telemetry collar, so officers can monitor the sow’s location if they are in its area. Jim Pissot, executive director of Defenders of Wildlife Canada, was disappointed to hear the news of the bears. Pissot asked how many citations were issued to people with dogs off leash and how many people were observed walking their dogs off leash. Relocation doesn’t always work, he said. The area is patrolled and monitored and tickets have been given to people disobeying the law, Naylor said. Late Tuesday, a person reported seeing a grizzly bear with two cubs on Junction Three by the Banff Trail at the Nordic Centre. “We are trying to confirm wether it is a grizzly or black bear,” Naylor said. Warning signs are also up on the Many Springs Trail in Bow Valley Provincial Park due to a grizzly bear in the area. This year there is a bumper crop of buffaloberries and people going into wooded areas should stay alert, carry bear spray, travel in groups, make noise and of course, keep dogs on-leash Naylor said. 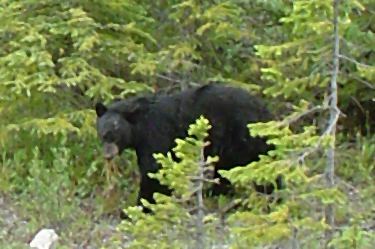 Hikers and campers are being warned once again to be on the watch for bears in the Jasper region. Grizzlies and black bears have been flocking to the area because of strong crops of buffalo berries in the low- and mid-mountain ranges in Jasper National Park, the same areas popular with tourists. Bears are being attracted to tourist areas by bountiful berry crops. “Most of our facilities are those low- to mid-elevation areas. That’s where most of our trails are, that’s where a lot of our back country campgrounds are also, and of course our front country campgrounds,” said Wes Bradford, the park’s wildlife conflict specialist. Bradford says last year’s wet weather is responsible for the strong berry crops. So far there have been no instances of bears actually knocking someone down, but officials say they are getting nearly a call a day about people bumping into bears on the trail. Bradford advises people in the area to travel in groups and check for updates on trail closures. A similar warning was made for the Jasper and Bow Valley regions last month.